HeroScape's subtitle is "The Battle of All Time," and it indeed is. Everything about this game is well done: the figures, the terrain, the rules, the scenarios. If you're at all interested in the theme (battles involving warriors from different time periods), we strongly recommend that you try HeroScape. This is as elegant as I can imagine a battle game being. Its simplicity ensures that it will be played for countless hours by young boys—and the young at heart. Deservedly so. But it's also flexible enough to be enjoyed by more serious gamers. Here's our full review of the game. One of the best parts of playing HeroScape is building an army and discovering how the different characters can work together. The HeroScape Master Set, Rise of the Valkyrie, includes 10 heroes and six squads with a variety of powers. For a beginner, the army options can seem overwhelming. With a little knowledge, you can feel confident that your army will be competitive. Many expansions have been released for HeroScape. This character checklist (organized by faction) includes all of the official characters. Checklists organized by expansion, package, and race are also available. Building the battlefield before a HeroScape game is, for some players, one of the best parts of the game. The interlocking hexagons provide an almost infinite number of possible combinations. HeroScape's Master Set includes a remarkable amount of terrain. But if you want to build an epic HeroScape battlefield, you need more than just the Master Set. Here are my suggestions on what to buy. If you enjoy HeroScape, the Fortress of the Valkyrie is a must-buy. This castle expansion is the most impressive addition of new terrain, by far, for the HeroScape game. It comes with 141 pieces, plenty to build a castle worthy of the Master Set. The pieces are also flexible, allowing creative minds to use the walls and battlements in interesting ways. Although you don't need to know it to play the game, HeroScape's dozens of armies were originally separated into five distinct groups: those who follow Einar, Jandar, Ullar, Utgar, and Vydar. (A sixth faction, Aquilla, was introduced later.) The HeroScape Flag Bearers, which were available only at Toys R Us stores, made those divisions more important. 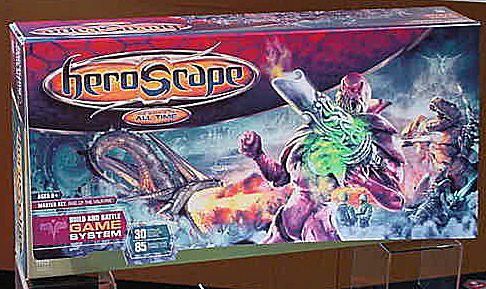 HeroScape has always been ideally suited for superhero characters, and Marvel HeroScape finally makes that happen. Although the battlefield is small compared to the original game, the battles are not. You can also take a look at our Marvel HeroScape character checklist, and two photo galleries of Marvel HeroScape: one from Gen Con and one from the American International Toy Fair.